Street food is one of the things that makes Bangkok a real pleasure to visit or to live in. There is such a variety of food, almost all of it of high quality and flavor. A recent favorite of mine is a long-standing Sukhumvit Road staple: Guaytiaw Pikgai Sai Nampung. This is a typical noodle shop selling honey-braised chicken. 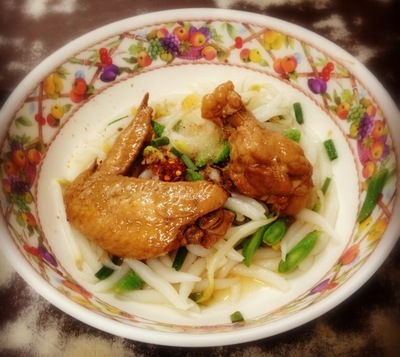 This is a bowl of “dry” noodles (broth served in a separate bowl on the side) with a wing and drumstick. Some bean sprouts and chopped long beans. Many different types of noodles are available. I chose giam ee, a hand-rolled rice noodle similar to German spätzle. I like it because it is easier to eat than long noodles and holds onto the seasonings better, too. The chicken is very tender, sweet and flavorful with the hint of honey to it. You can also choose other parts of the chicken if you prefer breast meat, for example. There are other ingredients available, too, in case you prefer further customization. Here in Thailand, the noodle shops are all about customization! More a picture of Tawn than of the shop, but you can see that it is neat and tidy, even though it has been opens for many years. The walls are hung with newspaper clippings, family photos, and photos of His Majesty the King. The laminated table tops have worn with age but are kept sparkling clean. If you are interested in visiting, the restaurant is in Sukhumvit Soi 20/1, a small dog-legged alley that connects to Sukhumvit road just about 10 meters west of the mouth of Soi 20. The restaurant is the fourth or fifth shop in on the right-hand side. You will see the aunty cooking just outside the front of the shop, the smell of the chicken beckoning you. This entry was posted in Uncategorized and tagged Bangkok, chicken, food, guaytiaw, noodles, street, streetfood, Thailand, vendor by christao408. Bookmark the permalink. I could use some of that food right now. Nice smile! And now I feel like having some noodles. I should have made plans to stop by at Bangkok. 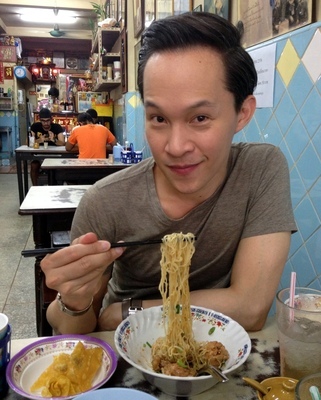 Those noodles seriously makes my stomach growl. The camera person better be you, Tawn has that look about him. Looks very tasty! I love the expression on Tawn’s face! hehe! I think he would rather you eat than take photos! OK, so you got a handsome life partner lolol. The food look good and the shop very neat and clean.